Figure A55. Manila anomaly, interpreted as the Manila slab, with (horizontal) [vertical] cross sections through (A)[D] the UUP07 p-wave) and (B)[D] the combined SL2013 and S40RTS s-wave models at 230 km; C) the location of the modern geological record that we interpret to have formed during the subduction of the slab. The Manila anomaly (Figure A55) is located below the northwestern Phillipine Sea in the upper mantle. 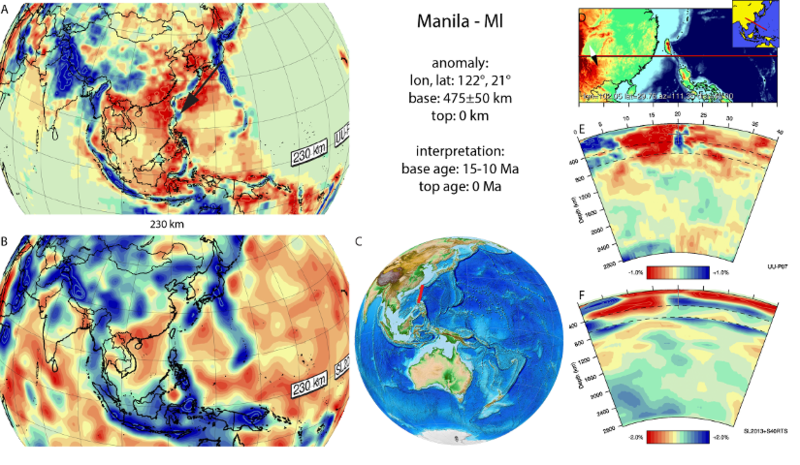 The Manila anomaly dips down towards the transition zone at the base of the upper mantle and has previously been imaged in several regional and global tomographic studies (Rangin et al., 1999; Lallemand et al., 2001; Zhao and Ohtani, 2009; Zheng et al., 2013; Koulakov et al., 2014; Wu et al., 2016), named South China Sea slab (Rangin and Spakman, 1999; Lallemand et al.2001), or Eurasian slab (Zheng et al, 2013; Zhao and Ohtani, 2009; Wu et al., 2016). It is interpreted as eastward dipping South China Sea oceanic lithosphere of the Eurasian plate still subducting at the Manila trench below the Luzon arc. In the north, continental lithosphere of the South China block has entered the trench, which led to an arc-continent collision with the Luzon arc, creating the Taiwan fold-thrust belt (Sibuet and Hsu, 2004; Huang et al., 2014). Due to Pliocene arc-continent collision, subduction in northern Taiwan is terminating and slab break-off is currently going on, whereby the Ryukyu subduction zone is propagating westwards, accommodating a subduction polarity flip (e.g., Ustaszewski et al., 2012). Estimates for the onset of Eurasian plate subduction below the Luzon arc are 15-10 Ma (Sibuet and Hsu, 2004; Hall, 2012), which we adopt for the age of the base of the Manila slab.